Henry Nicholson Morse (1835-1912), "bloodhound of the far west," was an Old West lawman. Elected September 2, 1863 served from 1864 to 1878, as the sheriff of the Alameda County Sheriff's Office of Alameda County, California. He was a Republican. 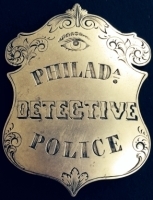 He later founded the Harry N. Morse Detective Agency in California. One of his accomplishments was to help (along with his associate James Hume) identify Charles E. Bowles as the perpetrator of the Black Bart stagecoach robberies. Other notable early California outlaws he helped bring to justice include Bartolo Sepulveda, Narrato Ponce, "Red-Handed Procopio, and Juan Soto. 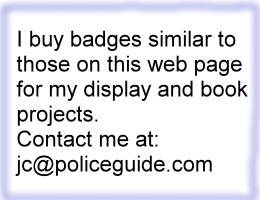 Earliest known style of badge for Morse Patrol. Made by Reininger San Francisco. Cabinet card image of Morse Patrol officer. San Francisco. Cabinet card image close up of Morse Patrol officer. San Francisco. 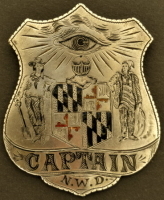 Second known style of badge for Morse Patrol. Made by Reininger San Francisco.